The brightest 1 million galaxies will be mapped by 2014, giving astronomers and unprecedented 3D map of the universe. At the last dim horizon, we search among ghostly errors of observations for landmarks that are scarcely more substantial. The search will continue. The urge is older than history. It is not satisfied and it will not be oppressed. Edwin Hubble not only contributed to our understanding of the universe, but he was part of the group of visionaries who initiated the Palomar Observtory Sky Survey, a collection of photographic plates that mapped stars, galaxies, and nebulae across much of the sky. Now astronomers are upgrading to HD with a new image. The recently released Sloan Digital Sky Survey is the largest digital image of the sky to ever be produced. Millions of 2.8-megapixel images combine to make a color image that contains over a trillion pixels. To put that into perspective, to view the image at its full resolution would require about 500,000 high-definition TVs. Completed in 1958, the Palomar Survey was built by piecing together 14-inch square photographic plates, 1,872 plates in all. Each snapshot was actually the combination of two pictures, one with a plate sensitive to red light, the other sensitive to blue light. Combining the two plates allowed astronomers to determine the true color of celestial objects. The Sloan Survey was assembled from digital pictures taken with a 138-megapixel camera attached to the Apache Point Observatory telescope in New Mexico. The Palomar also takes pictures in different colors, but it improves on Palomar’s two colors with five. The image’s resolution range really is astounding. At the bottom of the image below the southern and northern hemisphere views of the entire Survey are shown. Zooming into the southern hemisphere view spot Messier 33 (M33), a spiral galaxy such as our own. Zooming in on an arm region reveals a green cloud surrounded by bright blue stars. The green cloud is hydrogen gas that is being lit up by hot, newly formed blue stars. This region of M33 is a star nursery where new stars are constantly being created (find a high resolution image here). While collecting data for the map, astronomers also measured the full spectrum of light for the brightest one million galaxies. Breaking up the galaxies into their component wavelengths allows their true distances to be calculated. Spectral data gathering for the galaxies began in 2009 and won’t be completed until 2014. 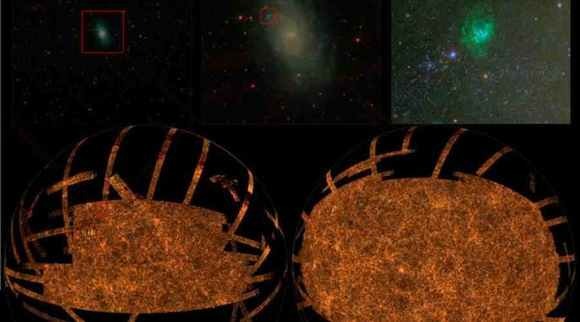 When all the data has been collected, astronomers will use it to construct a 3D map of the universe, which could potentially be used to solve some of cosmology’s most perplexing questions. Edwin Hubble was one of the visionaries who initiated the Palomar Survey. His main contributions to astronomy were the discovery of galaxies beyond our own and then realizing that not only were other galaxies moving away from our own Milky Way, but the further they were from us the faster they moved. He came to a bizarre conclusion: the universe is expanding at ever-increasing rates. The question of why universe expansion is speeding up is widely considered to be the biggest mystery in cosmology today. So it’s poetic that this second generation survey could help astronomers solve the mystery. Mapping the galaxies will also shed light on another great mystery: dark energy. Intertwined with accelerating universe theories, galaxy measurements will test many of the predictions that arise from different theories about dark energy. The camera used to take the images has a resolution of 138-megapixels. By comparison, top-of-the-line, common use digital cameras are about 11-megapixels. Now that it’s done its job, the camera will be retired and placed in the Smithsonian where it will be remembered for its contribution to astronomy. We continue to squint at Hubble’s horizon, doing our best to differentiate between ghostly errors and true landmarks. We’ve replaced photographic plates with digital images that can be shared instantaneously over the Internet. The standard has been set again after half a century’s time. When, years from now, it’s time to replace an outdated Sloan Survey with technologies of the time, what new glimpses of the sky will the next Survey offer, and what discoveries will the Sloan Survey have facilitated? One can only guess, but as Hubble said, we can be certain that the search will continue.